East West Banking Corporation (EastWest) today listed on the Philippine Dealing Exchange Corp. (PDEx), the country’s fixed income trading platform, the first tranche of its planned P15 billion Long-term Negotiable Certificates of Time Deposit (LTNCD) offering this year. The first tranche of the peso-denominated LTNCD offering is worth P2.45 billion and will have a coupon rate of 4.625 percent and maturity date of December 7, 2023. Sole Issue Manager and Arranger is Unicapital, Inc., with EastWest Bank as selling agent. 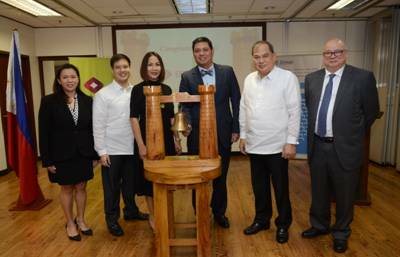 The bank marked the said offer listing with a bell ringing ceremony at the Philippine Dealing System Office in Makati City. Present at the ceremony were (from left) Unicapital FVP for Treasury Daisy Garcia, EastWest SVP, Chief Trust Officer and Chief Investment Officer Robert Ramos, EastWest SVP and Head of Wealth Management Abigail del Rosario, EastWest FVP and Head of Distribution Group Raul Victor De Guzman, PDS Group President Cesar Crisol, and PDEx President and COO Antonino Nakpil. Proceeds from the LTNCDs will be used to expand EastWest’s long-term deposit base, as well as support major funding needs of the bank. LTNCDs are peso-denominated, negotiable certificates of time deposits which carry relatively higher interest rates and have longer maturity period than regular time deposits. BSP approved the P15 billion LTNCD offering last May 16, 2018, which follows the successful completion of the bank’s P10 billion LTNCD offering in 2017. EastWest is one of the largest universal banks in the Philippines today, catering to the financial needs of consumers, middle market corporates, and the mass affluent. It reported a net income of P945 Million and 9.6% return on equity in the first quarter of the year.